It’s been a very long time coming, but the second Cosmic Quest movie is finally here! Read it here. Trust me, you don’t want to miss this one. An evil known as Nemex has continuously wiped out life on Earth in an endless cycle of destruction, and the time for it to assert its influence has come once again. An unsuspecting Ash has a great destiny thrust upon him when he learns he must join the Legendary Pokémon of Sun, Heliosol, in combat to stop Nemex, but all Ash wants to do is save Pikachu. Includes the Pikachu Short, Detective Pikachu and the Case of the Coin Caper! Description: A destructive force that is the opposite of the Cosmic Architect. This Pokémon periodically causes mass extinctions on Earth. Trivia: Little is known about this mysterious Pokémon that opposes the Cosmic Architect in many ancient myths. It seems to be an entity of pure destruction and malice that lives on the extreme edge of the Solar System. It can exert its sinister influence over vast distances to cause rampant destruction. It is believed to be the cause the periodic mass extinctions that plague the Earth, including the one that wiped out the Fossil Pokémon. Nemex’s name combines the concepts of Nemesis and Planet X, two theoretical celestial bodies on the fringe of the Solar System whose gravitational influence possibly leads to mass extinctions on Earth. Nemesis would be a brown dwarf star and Planet X a ninth planet. Concepts of both are woven into Nemex’s design. It is the second of Tenno’s event-exclusive Legendaries. The will of the user is exerted from afar, bringing disaster to the target. All other Pokémon take damage at the end of each turn. I know it’s been a long while, but this post is my way of promising that Nemex Unleashed is coming soon. It’s been a busy summer, but I’m back to work on writing. Shouldn’t be too much longer now. 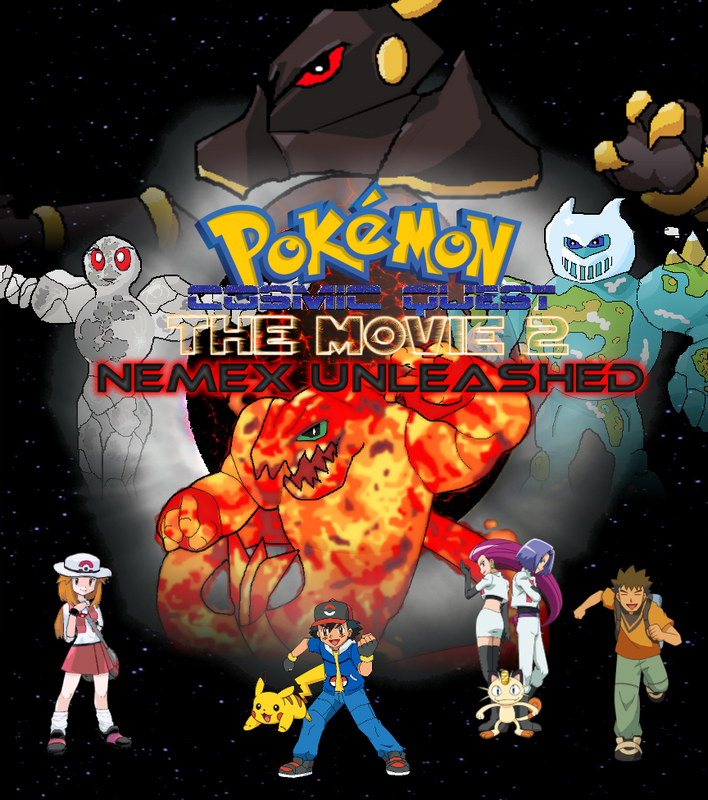 The next Cosmic Quest movie has its title, it’s called Nemex Unleashed. This is the final version of the movie’s poster. 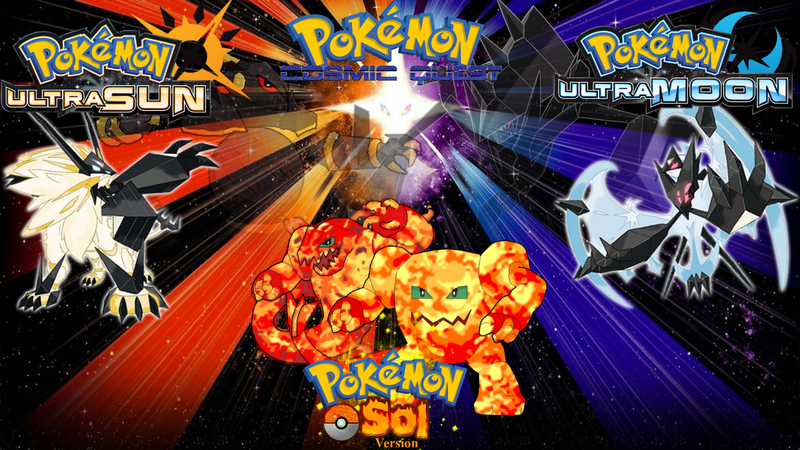 It would seem that new cover Pokémon of Sol Version has taken Heliosol’s spot on the poster. And what’s the deal with the menacing Pokémon in the background? Could it be the titular Nemex? Nemex Unleashed will be coming soon. Stay tuned. And if you haven’t seen the anniversary post about Sol Version yet, be sure to scroll down a little and check it out.